The law marked a radical expansion of the “War on Terrorism,” and the most ambitious campaign yet by industry groups, corporations, and the politicians that represent them to demonize animal rights and environmental activists as “eco-terrorists.” Most people have never even heard of the law… including most members of Congress. Here, for the first time, are some of the internal documents outlining how corporations and industry groups planned to label activists as “eco-terrorists.” I have obtained them from a source who wishes to remain anonymous. 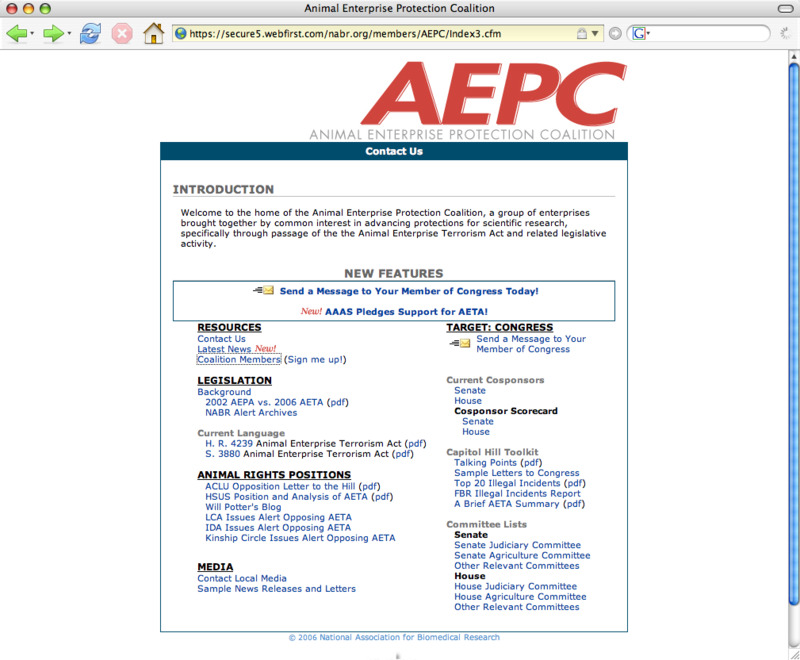 They’re the creation of the Animal Enterprise Protection Coalition, a network formed for the sole purpose of passing this “eco-terrorism” legislation. Members include corporate powerhouses like Pfizer, Wyeth, GlaxoSmithKline, and industry groups like the Fur Commission and National Cattlemen’s Beef Association. The coalition was put together by the National Association for Biomedical Research, an industry group that has one of the most outspoken proponents of the “Green Scare.” In short, this coalition is a front group comprised of other front groups. The coalition supplied its members with talking points, fact sheets, letters to Congress, news releases and more to help keep them on message when labeling activists as terrorists. A good example of the misinformation tactics used by the coalition is in their sample letter to members of Congress. What these documents don’t mention is that the SHAC members were convicted using the ORIGINAL version of the law, the Animal Enterprise Protection Act. So, in other words, if you think this law should be used to go after anti-apartheid style campaigns against animal industries, and if you think this law should be used to target those activists as “terrorists”… the government was already doing that successfully. These groups, though, misled lawmakers because they wanted more. 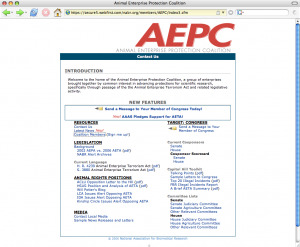 A key component of this “eco-terrorist” smear campaign has been working that T-word into the media, and the Animal Enterprise Protection Coalition clearly understood this. Makes it sound like they’re murdering people, doesn’t it? Or at least causing bodily harm? But that has never happened: a point intentionally ignored by supporters of this new terrorism law. The talking points for corporate members include a number of inaccuracies and deceptions used instill fear of this “terrorism” threat. What the talking points don’t mention, of course, is that this is based on numbers from the Foundation for Biomedical Research, the creator of the front group pushing this legislation. Their “Illegal Incidents Report” is full of colorful charts and graphs illustrating this trend. But if you dig deeper, and take a look at the spreadsheet with the data they used for this report, it simply doesn’t hold water. For instance, the data includes “illegal incidents” in the UK, New Zealand, and even Russia (“Activists opened the cages of a bird research lab at Moscow State University”). What do prank calls and stolen birds in Russia have to do with “terrorism” legislation in the United States? It is interesting to see how these groups describe animal and environmental activists in their own words. Some of their talking points will probably be seen as badges of honor for activists. 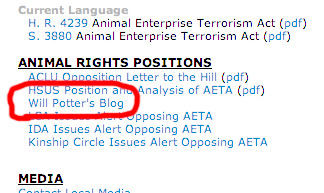 Stay tuned for part two in the series: New documents show industry groups understood they didn’t have enough votes for the Animal Enterprise Terrorism Act, so they tried to sneak it through Congress. Previous post: “Eco-terrorist” Bootie Shorts! Next post: Are You on Twitter?